What’s New with Wireless in Vista? The Perfect Reference for the Multitasked SysAdmin The Microsoft Windows Vista operating system offers several changes and improvements over its predecessors. It not only brings a new and redesigned interface, but also improves on many administrative utilities and management consoles. It also enhances the system’s reliability, performance, and problem-solving tools. As administrators, Vista will sometimes look like its predecessor, Windows XP, and at other times, look like an all-new operating system. 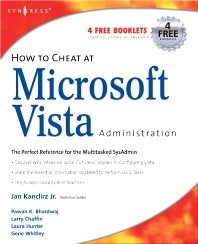 How to Cheat will help you get Vista up and running as quickly and safely as possible and provide you with a solid idea of all the important changes and improvements the new Microsoft Vista OS has to offer. Automate Windows Vista Installation See how Windows installations can be automated for large-scale deployments using the Windows Automated Installation Kit (WAIK). Install and Maintain Devices Windows Vista contains device drivers for hundreds of PnP devices, and the Device Manager snap-in is the main utility on a local computer for managing them. Customize Appearances, Taskbars, and Toolbars See how to use a personalization page, use the taskbar, and customize desktop themes. Manage File System Formats, Partitions, and Volumes Learn how Windows Vista supports basic and dynamic volumes and two partition styles: MBR and GPT. Increase File System Performance Learn how using tools such as disk defragging, cluster size adjustment, removing short filename support, and compression can help with performance. Administer via Remote Remote Desktop and Windows Firewall can help administrators perform administrative tasks on remote computers. Managing Services The Services utility allows you to view the status of services, as well as to disable nonessential services. Configure TCP/IP in Vista See how to configure TCP/IP (both IPv4 and IPv6) via the user interface or via the netsh command. See What’s New with Wireless in Vista Understand wireless security and learn how to install a wireless network. Optimize Windows Startup, the Hard Disk, and More Optimize memory, applications, and the network connection, and see how to monitor performance. Jan Kanclirz Jr. (CCIE #12136-Security, CCSP, CCNP, CCIP, CCNA, CCDA, INFOSEC Professional, Cisco WLAN Support/Design Specialist) is currently a Senior Network Information Security Architect at IBM Global Services. Jan specializes in multi vendor designs and post-sale implementations for several technologies such as VPNs, IPS/IDS, LAN/WAN, firewalls, content networking, wireless and VoIP. Beyond network designs and engineering Jan’s background includes extensive experience with open source applications and Linux. Jan has contributed to several Syngress book titles: Managing and Securing Cisco SWAN, Practical VoIP Security and How to Cheat at Securing a Wireless Network. In addition to Jan’s full-time position at IBM G.S., Jan runs a security portal www.MakeSecure.com, where he dedicates his time to security awareness and consulting. Jan lives in Colorado, where he enjoys outdoor adventures.